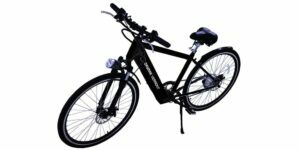 The Daymak Vermont Ebike is just $1695, even your kids can buy it after saving up! This electric bicycle comes in Black, White, Orange, and Red colors. Powered by a 250 watt brushless high hub lithium 36V along with an 9AH motor, this scooter has a battery cycle of 800-1000. It has a top speed of 30kmph which can have you gliding through the toughest of traffic jams in the city. You won’t have to worry about keeping your clients waiting or having to wait out on getting to friends. The 36V Vermont is a step through ebike that is simple to hop and ride and with it’s 19” frame, it is great for smaller riders. The Vermont also comes with and internal battery pack in the frame, giving it a more clean and elegant look. If you are still looking to get a bit of exercise the Vermont 36V ebike comes with a 6 Speed Shimano Tourney TZ quick shift set to provide easy and seamless shifting between gears. It also comes with dual disc brakes for quick an effective stopping power, and front shocks for a smooth ride.